A divorce is an extremely personal matter that is filled with many emotional ups and downs. However, you must put all the emotions aside and consider your future. If you do not remain objective, you could easily be cheated out of fair settlement at the end of your divorce. You may be entitled to financial support if your spouse earns significantly more than you do. If you and your spouse have children that will live with you after the divorce, you may be entitled to child support as well. Usually, in a divorce, spouses will share the value of the property. Your share of the value of the property will depend on how much you were worth at the beginning of the marriage and how you’ll be worth after the divorce, among other factors. Once you agree on support payments, outline the specifics of that support. Whether it be spousal support or child support, list all the details of these provisions. In this section of your divorce settlement agreement, you should include current incomes and the incomes used to calculate support. In Ontario, the law does not stipulate an automatic end date for child support, therefore if you want to child support to end when children reach a certain age, you will need to include this in your agreement. You should also include how long spousal support will be paid and reasons spousal support will be terminated such as if the spouse receiving support remarries. Even if your separation is amicable, and you and your spouse seem to be on the page regarding your divorce, still create a detailed parent schedule. You may think that it isn’t necessary, that you and your spouse can figure it out as you go along. However, things may change as time progresses and you may find yourself with schedule disputes. To avoid any such disputes, note where your children will spend their time, including holidays, in your divorce settlement agreement. Whenever you are trying to create a divorce settlement agreement, always keep documents relating to your marriage and financial matters involved in running the household handy. There are a host of documents you’ll need to finalize your divorce settlement agreement. These documents include a copy of your marriage certificate, salary slips, tax returns, retirement plans, insurance policies, employee benefit statements, deed or lease agreement for your house, mortgage agreement, documents showing outstanding debt, birth certificates and other documents relating to your children. In Canada, it is common for partners to enter a marriage contract before they tie the knot. You may even sign a marriage contract after you’ve already been married. This is a great way to ensure your interests will be protected in the event of a divorce. Having a solid and fair financial plan can help make the divorce process move along quicker and more smoothly. A family lawyer may be able to help you create a marriage contract that could later save you from the hassle of creating a divorce settlement agreement. If you are finding it difficult to negotiate with your spouse or need help finalizing your divorce settlement agreement, you should consult a divorce settlement agreement lawyer. During a divorce, it is normal to harbour feelings of anger, hurt and These feelings can make it difficult to work through the issues with your spouse. Fortunately, when you hire a divorce settlement agreement lawyer you won’t need to go back and forth with your spouse. Your lawyer will act as the go-between. Your lawyer will tackle all the important issues and handle the paperwork for you. Do you need a divorce settlement lawyer in Toronto? 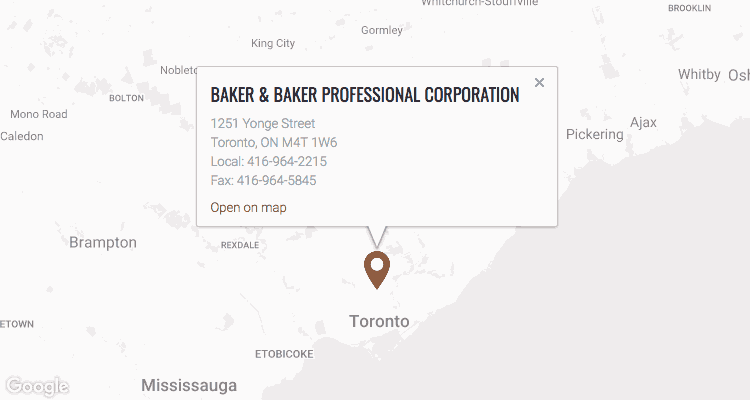 If you are going through a divorce in Toronto and need a divorce settlement agreement lawyer, contact us at Baker and Baker Family Law. With over 90 years of combined experience handling complicated family matters, we are in a strong position to help. So, what are you waiting for? Give us a call today to schedule a free legal consultation with one of our divorce settlement agreement lawyers.